The original building when Covenant Woods relocated to Hanover County in 2001, the classically designed Manor is main entry point to the community. If you aren’t first welcomed by a resident on the porch sipping morning coffee or an evening cocktail, you’ll be greeted by an inviting living room in the foyer, filled with history of the Richmond Home for Ladies, the predecessor community founded in 1883. Directly ahead of you is Traditions, the recently renovated main dining room open for lunch and dinner and providing a range of daily entrees and private dining for smaller groups. 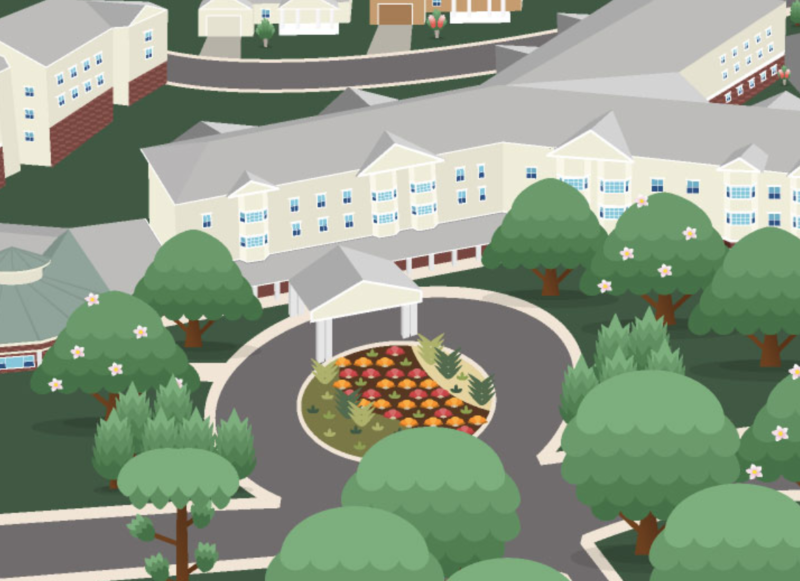 The Manor splits to the West and East; to the West, the amenities and homes of independent living, and to the East, the new expansion with 120 private rooms and suites for healthcare, assisted living, and memory care. The Manor is home to studio apartments for individuals and larger floor plans up to 1,300 square feet, all within a short walk to amenities and recreation. Dining options include Traditions, the community’s main dining room, and The Bistro, for grab-and-go foods plus coffee, tea, and espresso. Get active at Centerpointe, home to a fitness studio, gym, day spa, health clinic, and an 80-foot, heated indoor saltwater pool.